Note: While Augustus Strong has a great deal of good and sound theology, not all of it is, so the inclusion of this eBook does not entail an complete endorsement of everything he affirms. Some of his ideas about inclusionism, evolution and ambiguous assertions about monergism/synergism, in our view, are Scripturally problematic. Nonetheless students of theology may still find much to be gleaned here. 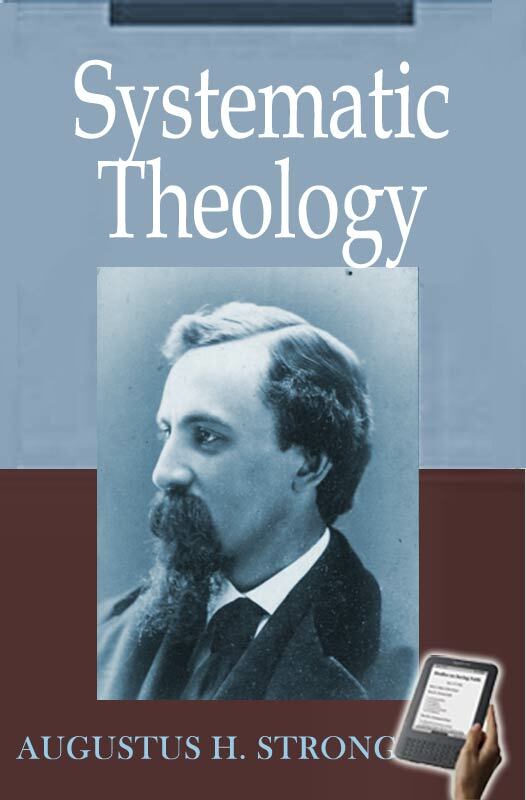 The present work is a revision and enlargement of my “Systematic Theology,” first published in 1886. Of the original work there have been printed seven editions, each edition embodying successive corrections and supposed improvements. I print this revised and enlarged edition of my “Systematic Theology,” in the hope that its publication may do something to stem this fast advancing tide, and to confirm the faith of God's elect. I make no doubt that the vast majority of Christians still hold the faith that was once for all delivered to the saints, and that they will sooner or later separate themselves from those who deny [pg x] the Lord who bought them. When the enemy comes in like a flood, the Spirit of the Lord will raise up a standard against him. I would do my part in raising up such a standard. I would lead others to avow anew, as I do now, in spite of the supercilious assumptions of modern infidelity, my firm belief, only confirmed by the experience and reflection of a half-century, in the old doctrines of holiness as the fundamental attribute of God, of an original transgression and sin of the whole human race, in a divine preparation in Hebrew history for man's redemption, in the deity, preëxistence, virgin birth, vicarious atonement and bodily resurrection of Jesus Christ our Lord, and in his future coming to judge the quick and the dead. I believe that these are truths of science as well as truths of revelation; that the supernatural will yet be seen to be most truly natural; and that not the open-minded theologian but the narrow-minded scientist will be obliged to hide his head at Christ's coming. The present volume, in its treatment of Ethical Monism, Inspiration, the Attributes of God, and the Trinity, contains an antidote to most of the false doctrine which now threatens the safety of the church. I desire especially to call attention to the section on Perfection, and the Attributes therein involved, because I believe that the recent merging of Holiness in Love, and the practical denial that Righteousness is fundamental in God's nature, are responsible for the utilitarian views of law and the superficial views of sin which now prevail in some systems of theology. There can be no proper doctrine of the atonement and no proper doctrine of retribution, so long as Holiness is refused its preëminence. Love must have a norm or standard, and this norm or standard can be found only in Holiness. The old conviction of sin and the sense of guilt that drove the convicted sinner to the cross are inseparable from a firm belief in the self-affirming attribute of God as logically prior to and as conditioning the self-communicating attribute. The [pg xi] theology of our day needs a new view of the Righteous One. Such a view will make it plain that God must be reconciled before man can be saved, and that the human conscience can be pacified only upon condition that propitiation is made to the divine Righteousness. In this volume I propound what I regard as the true Doctrine of God, because upon it will be based all that follows in the volumes on the Doctrine of Man, and the Doctrine of Salvation. Chapter I. Idea Of Theology. 1. The existence of a God. 3. God's revelation of himself to man. V. Relation of Theology to Religion. Chapter II. Material of Theology. III. Relations of Material to Progress in Theology. Chapter III. Method Of Theology. I. Requisites to the study of Theology. III. History of Systematic Theology. IV. Order of Treatment in Systematic Theology. Part II. The Existence Of God. Chapter I. Origin Of Our Idea Of God's Existence. I. First Truths in General. II. The Existence of God a first truth. 3. Its logical independence and priority. III. Other Supposed Sources of our Idea of God's Existence. IV. Contents of this Intuition. Chapter II. Corroborative Evidences Of God's Existence. I. The Cosmological Argument, or Argument from Change in Nature. II. The Teleological Argument, or Argument from Order and Useful Collocation in Nature. III. The Anthropological Argument, or Argument from Man's Mental and Moral Nature. IV. The Ontological Argument, or Argument from our Abstract and Necessary Ideas. Chapter III. Erroneous Explanations, And Conclusion. Part III. The Scriptures A Revelation From God. I. Reasons a priori for expecting a Revelation from God. II. Marks of the Revelation man may expect. III. Miracles, as attesting a Divine Revelation. 4. Amount of Testimony necessary to prove a Miracle. 5. Evidential force of Miracles. IV. Prophecy as Attesting a Divine Revelation. V. Principles of Historical Evidence applicable to the Proof of a Divine Revelation. 1. As to documentary evidence. 2. As to testimony in general. Chapter II. Positive Proofs That The Scriptures Are A Divine Revelation. I. Genuineness of the Christian Documents. 1. Genuineness of the Books of the New Testament. 1st. The Myth-theory of Strauss (1808-1874). 2nd. The Tendency-theory of Baur (1792-1860). 3d. The Romance-theory of Renan (1823-1892). 4th. The Development-theory of Harnack (born 1851). 2. Genuineness of the Books of the Old Testament. II. Credibility of the Writers of the Scriptures. III. The Supernatural Character of the Scripture Teaching. 1. Scripture teaching in general. 2. Moral System of the New Testament. 3. The person and character of Christ. 4. The testimony of Christ to himself—as being a messenger from God and as being one with God. IV. The Historical Results of the Propagation of Scripture Doctrine. Chapter III. Inspiration Of The Scriptures. IV. The Union of the Divine and Human Elements in Inspiration. V. Objections to the Doctrine of Inspiration. 1. Errors in matters of Science. 2. Errors in matters of History. 5. Errors in quoting or interpreting the Old Testament. 7. Certain books unworthy of a place in inspired Scripture. 8. Portions of the Scripture books written by others than the persons to whom they are ascribed. 9. Sceptical or fictitious Narratives. 10. Acknowledgment of the non-inspiration of Scripture teachers and their writings. Part IV. The Nature, Decrees, And Works Of God. Chapter I. The Attributes Of God. I. Definition of the term Attributes. II. Relation of the divine Attributes to the divine Essence. III. Methods of determining the divine Attributes. IV. Classification of the Attributes. V. Absolute or Immanent Attributes. First division.—Spirituality, and attributes therein involved. Second Division.—Infinity, and attributes therein involved. Third Division.—Perfection, and attributes therein involved. VI. Relative or Transitive Attributes. First Division.—Attributes having relation to Time and Space. Second Division.—Attributes having relation to Creation. Third Division.—Attributes having relation to Moral Beings. 1. Veracity and Faithfulness, or Transitive Truth. 2. Mercy and Goodness, or Transitive Love. 3. Justice and Righteousness, or Transitive Holiness. VII. Rank and Relations of the several Attributes. 1. Holiness the fundamental attribute in God. 2. The holiness of God the ground of moral obligation. Chapter II. Doctrine Of The Trinity. I. In Scriptures there are Three who are recognized as God. 1. Proofs from the New Testament. A. The Father is recognized as God. B. Jesus Christ is recognized as God. C. The Holy Spirit is recognized as God. 2. Intimations of the Old Testament. A. Passages which seem to teach plurality of some sort in the Godhead. B. Passages relating to the Angel of Jehovah. C. Descriptions of the divine Wisdom and Word. D. Descriptions of the Messiah. II. These Three are so described in Scripture that we are compelled to conceive of them as distinct Persons. 1. The Father and the Son are persons distinct from each other. 2. The Father and the Son are persons distinct from the Spirit. 3. The Holy Spirit is a person. III. This Tripersonality of the Divine Nature is not merely economic and temporal, but is immanent and eternal. 1. Scripture proof that these distinctions of personality are eternal. 2. Errors refuted by the foregoing passages. IV. This Tripersonality is not Tritheism; for, while there are three Persons, there is but one Essence. V. The Three Persons, Father, Son, and Holy Spirit, are equal. 1. These titles belong to the Persons. 2. Qualified sense of these titles. 3. Generation and procession consistent with equality. VI. Inscrutable, yet not self-contradictory, this Doctrine furnishes the Key to all other Doctrines. 1. The mode of this triune existence is inscrutable. 2. The Doctrine of the Trinity is not self-contradictory. 3. The doctrine of the Trinity has important relations to other doctrines. Chapter III. The Decrees Of God. II. Proof of the Doctrine of Decrees. A. From the Divine Foreknowledge. B. From the Divine Wisdom. C. From the Divine Immutability. D. From the Divine Benevolence. III. Objections to the Doctrine of Decrees. 1. That they are inconsistent with the free agency of man. 2. That they take away all motive for human exertion. 3. That they make God the author of sin. 1. Practical uses of the doctrine of decrees. 2. True method of preaching the doctrine. Chapter IV. The Works Of God; Or The Execution Of The Decrees. II. Proof of the Doctrine of Creation. 2. Indirect evidence from Scripture. III. Theories which oppose Creation. IV. The Mosaic Account of Creation. 1. Its twofold nature,—as uniting the ideas of creation and of development. V. God's End in Creation. 1. The testimony of Scripture. 2. The testimony of reason. VI. Relation of the Doctrine of Creation to other Doctrines. 1. To the holiness and benevolence of God. 2. To the wisdom and free-will of God. 3. To Christ as the Revealer of God. 4. To Providence and Redemption. 5. To the Observance of the Sabbath. II. Proof of the Doctrine of Preservation. III. Theories which virtually deny the doctrine of Preservation. IV. Remarks upon the Divine Concurrence. II. Proof of the Doctrine of Providence. III. Theories opposing the Doctrine of Providence. 3. Theory of a merely general providence. IV. Relations of the Doctrine of Providence. 1. To miracles and works of grace. 2. To prayer and its answer. 4. To the evil acts of free agents. Section IV.—Good And Evil Angels. I. Scripture Statements and Imitations. 1. As to the nature and attributes of angels. 2. As to their number and organization. 3. As to their moral character. 4. As to their employments. A. The employments of good angels. B. The employments of evil angels. II. Objections to the Doctrine of Angels. 1. To the doctrine of angels in general. 2. To the doctrine of evil angels in particular. III. Practical uses of the Doctrine of Angels. A. Uses of the doctrine of good angels. B. Uses of the doctrine of evil angels. Part V. Anthropology, Or The Doctrine Of Man. I. Man a Creation of God and a Child of God. II. Unity of the Human Race. 1. The argument from history. 2. The argument from language. 3. The argument from psychology. 4. The argument from physiology. III. Essential Elements of Human Nature. IV. Origin of the Soul. 1. The Theory of Preëxistence. V. The Moral Nature of Man. Chapter II. The Original State Of Man. I. Essentials of Man's Original State. 1. Natural likeness to God, or personality. 2. Moral likeness to God, or holiness. A. The image of God as including only personality. B. The image of God as consisting simply in man's natural capacity for religion. II. Incidents of Man's Original State. 1. Results of man's possession of the divine image. 2. Concomitants of man's possession of the divine image. Chapter III. Sin, Or Man's State Of Apostasy. Section I.—The Law Of God. II. The Law of God in Particular. III. Relation of the Law to the Grace of God. II. The Essential Principle of Sin. I. Every human being who has arrived at moral consciousness has committed acts, or cherished dispositions, contrary to the divine law. II. Every member of the human race, without exception, possesses a corrupted nature, which is a source of actual sin, and is itself sin. Section IV.—Origin Of Sin In The Personal Act Of Adam. I. The Scriptural Account of the Temptation and Fall in Genesis 3:1-7. 1. Its general, character not mythical or allegorical, but historical. 2. The course of the temptation, and the resulting fall. II. Difficulties connected with the Fall considered as the personal Act of Adam. 1. How could a holy being fall? 2. How could God justly permit Satanic temptation? 3. How could a penalty so great be justly connected with disobedience to so slight a command? III. Consequences of the Fall, so far as respects Adam. 2. Positive and formal exclusion from God's presence. Section V.—Imputation Of Adam's Sin To His Posterity. 1. The Pelagian Theory, or Theory of Man's natural Innocence. 2. The Arminian Theory, or Theory of voluntarily appropriated Depravity. 3. The New School Theory, or Theory of uncondemnable Vitiosity. 4. The Federal Theory, or Theory of Condemnation by Covenant. 5. Theory of Mediate Imputation, or Theory of Condemnation for Depravity. 6. The Augustinian Theory, or Theory of Adam's Natural Headship. II.—Objections to the Augustinian Doctrine of Imputation. Section VI.—Consequences Of Sin To Adam's Posterity. 1. Depravity partial or total? 2. The actual penalty of sin. Section VII.—The Salvation Of Infants. Part VI. Soteriology, Or The Doctrine Of Salvation Through The Work Of Christ And Of The Holy Spirit. Chapter I. Christology, Or The Redemption Wrought By Christ. Section I.—Historical Preparation For Redemption. I. Negative Preparation,—in the history of the heathen world. II. Positive Preparation,—in the history of Israel. Section II.—The Person Of Christ. I. Historical Survey of Views Respecting the Person of Christ. II. The two Natures of Christ,—their Reality and Integrity. 1. The Humanity of Christ. III. The Union of the two Natures in one Person. 1. Proof of this Union. 2. Modern misrepresentations of this Union. 3. The real nature of this Union. Section III.—The Two States Of Christ. I. The State of Humiliation. 1. The nature of this humiliation. 2. The stages of Christ's humiliation. II. The State of Exaltation. 1. The nature of this exaltation. 2. The stages of Christ's exaltation. Section IV.—The Offices Of Christ. I. The Prophetic Office of Christ. 1. The nature of Christ's prophetic work. 2. The stages of Christ's prophetic work. II. The Priestly Office of Christ. 1. Christ's Sacrificial Work, or the Doctrine of the Atonement. A. Scripture Methods of Representing the Atonement. B. The Institution of Sacrifice, more especially as found in the Mosaic system. C. Theories of the Atonement. 1st. The Socinian, or Example Theory of the Atonement. 2nd. The Bushnellian, or Moral Influence Theory of the Atonement. 3d. The Grotian, or Governmental Theory of the Atonement. 4th. The Irvingian Theory, or Theory of Gradually Extirpated Depravity. 5th. The Anselmic, or Commercial Theory of the Atonement. 6th. The Ethical Theory of the Atonement. D. Objections to the Ethical Theory of the Atonement. E. The Extent of the Atonement. III. The Kingly Office of Christ. Chapter II. The Reconciliation Of Man To God, Or The Application Of Redemption Through The Work Of The Holy Spirit. Section I.—The Application Of Christ's Redemption In Its Preparation. 1. Proof of the Doctrine of Election. 2. Objections to the Doctrine of Election. A. Is God's general call sincere? B. Is God's special call irresistible? Section II.—The Application Of Christ's Redemption In Its Actual Beginning. 1. Scripture Representations of this Union. 3. The Efficient Cause of Regeneration. 4. The Instrumentality used in Regeneration. 5. The Nature of the Change wrought in Regeneration. 2. Proof of the Doctrine of Justification. 4. Relation of Justification to God's Law and Holiness. 5. Relation of Justification to Union with Christ and the Work of the Spirit. 6. Relation of Justification to Faith. 7. Advice to Inquirers demanded by a Scriptural View of Justification. Section III.—The Application Of Christ's Redemption In Its Continuation. 2. Explanations and Scripture Proof. 3. Erroneous Views refuted by these Scripture Passages. 1. Proof of the Doctrine of Perseverance. 2. Objections to the Doctrine of Perseverance. Part VII. Ecclesiology, Or The Doctrine Of The Church. Chapter I. The Constitution Of The Church. Or Church Polity. I. Definition of the Church. A. The church, like the family and the state, is an institution of divine appointment. B. The church, unlike the family and the state, is a voluntary society. II. Organization of the Church. 1. The fact of organization. 2. The nature of this organization. 3. The genesis of this organization. III. Government of the Church. 1. Nature of this government in general. A. Proof that the government of the church is democratic or congregational. B. Erroneous views as to church government refuted by the foregoing passages. 2. Officers of the Church. A. The number of offices in the church is two:—first, the office of bishop, presbyter, or pastor; and, secondly, the office of deacon. B. The duties belonging to these offices. (b) Who are to ordain? 3. Discipline of the Church. IV. Relation of Local Churches to one another. 1. The general nature of this relation is that of fellowship between equals. 2. This fellowship involves the duty of special consultation with regard to matters affecting the common interest. 3. This fellowship may be broken by manifest departures from the faith or practice of the Scriptures, on the part of any church. Chapter II. The Ordinances Of The Church. 1. Baptism an Ordinance of Christ. 2. The Mode of Baptism. A. The command to baptize is a command to immerse. B. No church has the right to modify or dispense with this command of Christ. 3. The Symbolism of Baptism. A. Expansion of this statement as to the symbolism of baptism. B. Inferences from the passages referred to. 4. The Subjects of Baptism. A. Proof that only persons giving evidence of being regenerated are proper subjects of baptism. B. Inferences from the fact that only persons giving evidence of being regenerate are proper subjects of baptism. (a) Infant baptism is without warrant, either express or implied, in the Scripture. (b) Infant baptism is expressly contradicted. (c) The rise of infant baptism in the history of the church. (d) The reasoning by which it is supported is unscriptural, unsound, and dangerous in its tendency. (e) The lack of agreement among pedobaptists. (f) The evil effects of infant baptism. 1. The Lord's Supper an ordinance instituted by Christ. 2. The Mode of administering the Lord's Supper. 3. The Symbolism of the Lord's Supper. A. Expansion of this statement. B. Inferences from this statement. 4. Erroneous views of the Lord's Supper. B. The Lutheran and High Church view. 5. Prerequisites to Participation in the Lord's Supper. B. The prerequisites are those only which are expressly or implicitly laid down by Christ and his apostles. C. On examining the New Testament, we find that the prerequisites to participation in the Lord's Supper are four. D. The local church is the judge whether these prerequisites are fulfilled. E. Special objections to open communion. Part VIII. Eschatology, Or The Doctrine Of Final Things. III. The Second Coming of Christ. 1. The nature of this coming. 2. The time of Christ's coming. 3. The precursors of Christ's coming. 4. Relation of Christ's second coming to the millennium. 1. The nature of the final judgment. 2. The object of the final judgment. 3. The Judge in the final judgment. 4. The subjects of the final judgment. 5. The grounds of the final judgment. VI. The Final States of the Righteous and of the Wicked. (a) Is heaven a place, as well as a state? (b) Is this earth to be the heaven of the saints? A. The future punishment of the wicked is not annihilation. B. Punishment after death excludes new probation and ultimate restoration of the wicked. C. Scripture declares this future punishment of the wicked to be eternal. D. This everlasting punishment of the wicked is not inconsistent with God's justice, but is rather a revelation of that justice. E. This everlasting punishment of the wicked is not inconsistent with God's benevolence. F. The proper preaching of the doctrine of everlasting punishment is not a hindrance to the success of the gospel.